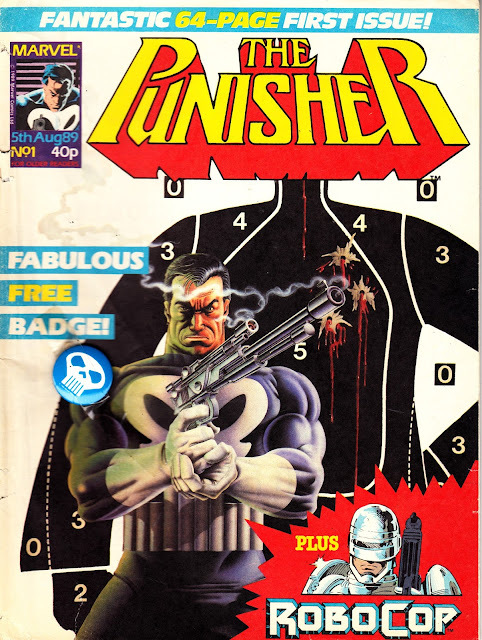 THE PUNISHER is one of those late-entry MARVEL UK books that generally seems to get overlooked. Launched 14 years ago (almost to the week), it arguably peaked too soon: the character was warming-up nicely across the Atlantic but wasn't yet at his early nineties peak where he fitted perfectly into the "big gun" aesthetics of the Dark Age of comics. The character was about to make his movie debut in the first - New World produced - Punisher "feature" film although its dubious quality (its really not that bad - albeit not terribly faithful to the comics either), patchy distribution and New World's financial predicament all conspired to make its impact minimal. M-UK were also pitching the weekly (very latterly fortnightly) at an older market: just before it became the flavour-of-the-month potential saviour of the British business. 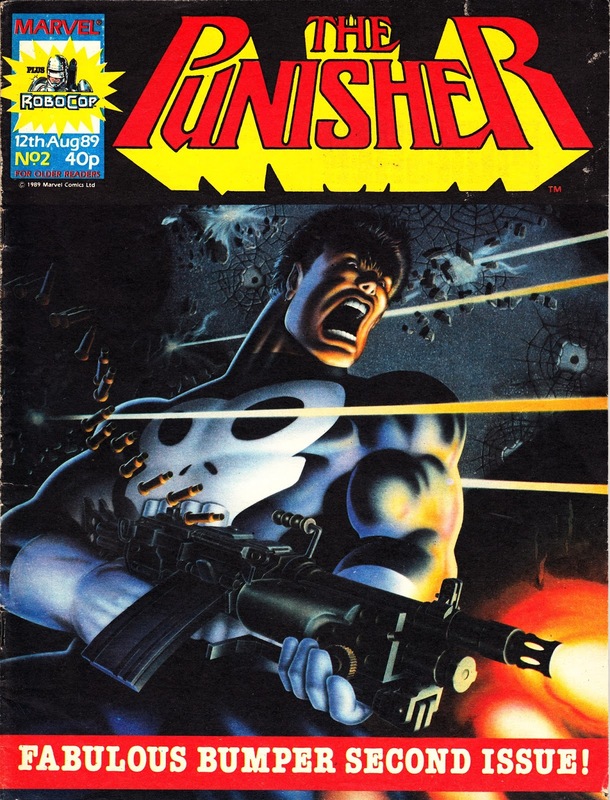 The Punisher racked-up 30 issues. The first 29 appeared weekly before - apparently at the last minute - switching to a fortnightly frequency with issue 30. Things were obvious worse than Arundel House first feared as although the 31st issue was promoted as usual, it never appeared. Frank Castle, in an old-of-continuity early appearance, did briefly transfer over to the (even more numerically challenged) STRIP. 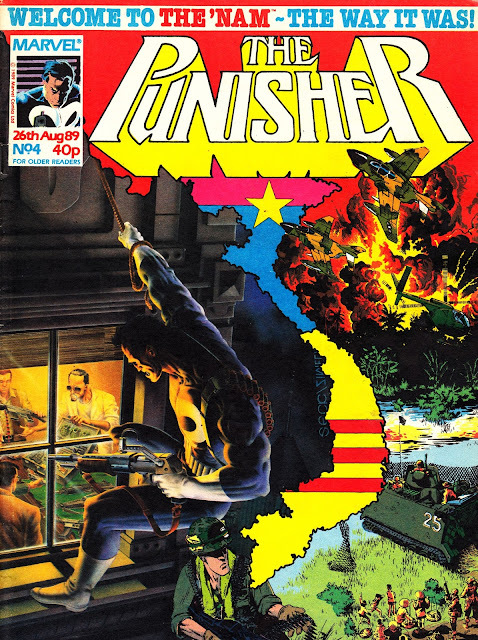 The title strip initially reprinted the limited series before picking-up with reruns of the ongoing US book. The back-up strip for the first three issues was another outing of Marvel's ROBOCOP movie adaptation (previously published in a one-shot special) before stepping aside in favour of THE 'NAM. Marvel's war-is-hell strip, once improbably mooted for a slot in ACTION FORCE, had gathered a lot of buzz (and - initially - a lot of readers) when it made its US debut a few years early. Harsh economics meant that the second feature was relegated to the the black & white pages (in the former's case it had originally appeared - on both sides of the Atlantic - sans colour) although cover-to-cover colour was added later. The first issue - a stonking double-sized outing - also came with a free pin badge. The copy I have still has it attached. The covers on the earliest issues were uncredited, a policy that was later reversed. There's a surprising amount of British-created covers for what was - really - an all-reprint weekly. 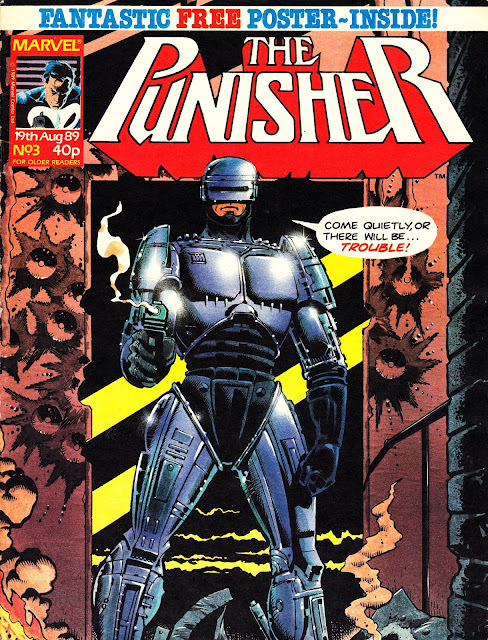 Marvel's post-movie ROBOCOP adventures made a brief British comeback as one of the strips in the even-shorter-lived HAVOC.